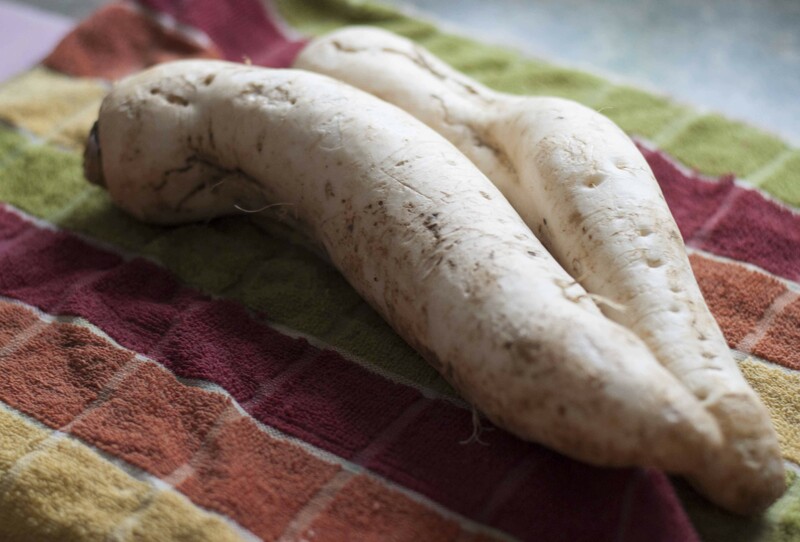 Spooning daikon want to warm you up! Nothing warms a cold winter soul faster than a big, brothy bowl of steaming, slurpable, noodley soup. Nothing I can think of, anyway. In my early twenties, I practically lived on miso noodle soup, which I would prepare quickly during lunch breaks from work, adding veggies and sometimes a bit of meat. The noodles varied, from instant ramen (sans flavor packet) to rice to glass to udon or, if I was in a super hurry, vermicelli. I haven't made it in years. But temperatures are dipping into the single digits. And veggies — a beautiful Savoy cabbage and two hulking daikon radishes from Glover's Heartwood Farm (a welcome presence at Burlington's winter farmers market this season) —are languishing in my fridge, the time seemed nigh for a snappy soup. Also, I'm still detoxing from the holidays, and probiotics — like miso and kimchi — can't hurt. This recipe makes a hearty but light midday meal, but add a soft-boiled egg or a bit of sliced beef, chicken or pork to the mix (boil this in the broth with the daikon), and it's a winning, one-bowl dinner, too. Make this heartwarming miso-based soup in 20 minutes or less. Cook the noodles, drain (and bathe in cold water, if using buckwheat) and place in the bottom of a large bowl. In a saucepan, boil four cups of water. Add miso paste and whisk until the paste is completely dissolved. Add the bonito flakes and daikon. Cover and boil over medium heat until the daikon softens but is still crisp, 10-15 minutes. Kill the heat and keep covered. In a large, shallow pan, sauté the oils, garlic and cabbage over medium heat. Add tamari and plum vinegar, cover and simmer, stirring often, until the cabbage is cooked but still chewy. Deglaze the pan with a bit of the miso broth and spoon the veggies in the bowl with the noodles. 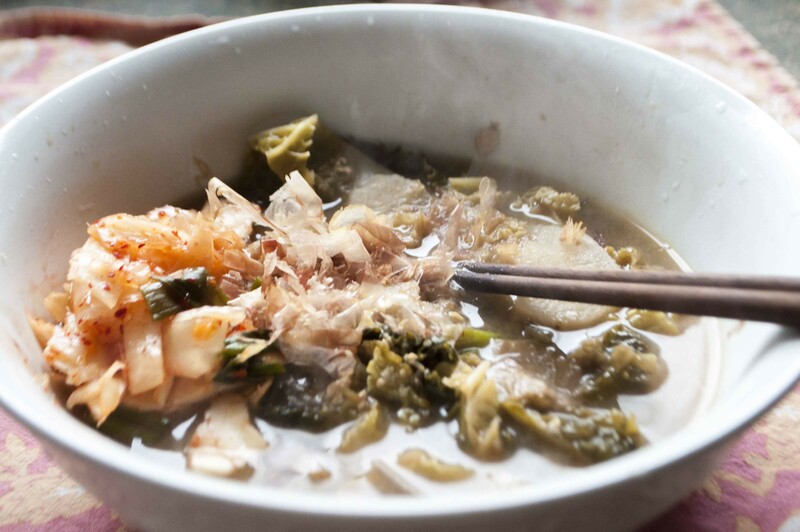 Pour the broth over all, garnish with kimchi and more bonito flakes, and serve immediately.